Abstract - FMO Advisory Services workshops provide a collaborative and programmatic approach that will prepare a data center for effective and efficient operations on Day 1 (‘Go Live’). 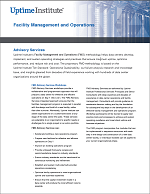 The FMO Advisory Services integrated approach ensures that the facilities management program is executed in parallel with the design and build of a new facility, rather than after turnover. Alternately, Uptime Institute can assist organizations on a customized basis at any stage of the data center life cycle. These services are adaptable to an organization’s specific needs or challenges for a single project or an entire portfolio.